Even though they haven’t been manufactured for more than 30 years, Checker Cabs remain one of the most iconic cars ever made. Here’s a look under the hood of this unique piece of American automotive history. Morris Markin was a Russian-Jewish tailor who emigrated to the United States in 1913 when he was in his late teens. He settled in Chicago, found work in the city’s garment district, and within a couple of years had his own business making ready-to-wear suits. When America entered World War I in 1917, he switched to making uniforms for the army. At war’s end Markin began looking outside the garment industry for new business opportunities. In 1920 he loaned $15,000 to a fellow immigrant named Abe Lomberg, who had a business manufacturing auto bodies for Commonwealth Motors, an assembler of purpose-built taxicabs. Markin may have wished he’d stuck to the garment industry, because Lomberg’s business and Commonwealth failed within a year of each other. Rather than cut his losses, Markin assumed control of both companies, merged them into a single firm, and renamed it after the company’s biggest client, Checker Taxi of Chicago. The automobiles that the Checker Cab Manufacturing Company made in the 1920s and 1930s had little in common with modern taxis. 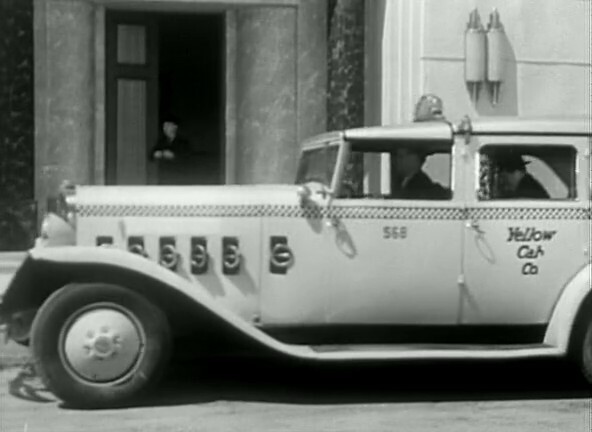 In those days cabs were hired almost exclusively by the wealthy. Everyone else took the bus, the streetcar, or the subway (or walked). Taxi passengers expected to ride in comfort, and Markin’s vehicles delivered. Early Checker Cabs were big, beautiful cars with well-appointed interiors. 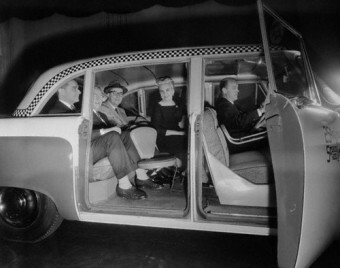 Some models came with down-filled seats that smartly uniformed cabbies fluffed up with a special paddle between fares. The cabs also developed a reputation for being rugged, reliable, and easy (and cheap) to repair, which made them popular with taxi companies and independent drivers alike. By the end of the 1920s, nearly half the cabs in New York City were Checkers, and the company had made inroads in Pittsburgh, Chicago, Minneapolis, and other American cities. The Great Depression of the 1930s, while bad for business, helped Markin to consolidate his hold on the taxi industry. General Motors, Markin’s biggest competitor, got out of the taxicab-manufacturing business altogether. And because Checker sold its cabs on credit, when taxi owners defaulted on their payments, Markin had little choice but to repossess the cabs and hire his own drivers to run them. By 1940 he was one of the nation’s largest operators of taxicabs, as well as a manufacturer. And since Markin was the one buying the cabs, that, in turn, guaranteed plenty of business for Checker Manufacturing. When the U.S. entered World War II in 1941, domestic automobile production was suspended as auto manufacturers retooled to supply matériel for the war effort. Checker was no exception: it made truck components and other equipment for the military. Then as soon as the war was over, it went back to making cabs. The first postwar Checkers were based on prewar designs; it wasn’t until 1956 that Checker (which by then had renamed itself Checker Motors) introduced an all-new car, called the A8, later renamed the Checker Marathon. It served as the basis for every taxicab the company made for the rest of its 25-year run. The Marathon was a far cry from the fancy cabs of the 1920s and 1930s. The interiors were as austere as school buses: its ceilings were made using a hard fiberboard material instead of fabric. Rubber floor mats took the place of carpeting, so drivers could clean the interior with a hose. And seamless, unpleated bench seats (seams and pleats trap dirt) replaced the down-filled cushions of yesteryear. What people remember most about the Marathon is the spacious interiors that seemed larger than many cramped Manhattan apartments. How much legroom do you have in the backseat of your car? The Checker Marathon had 46.3 inches—nearly four feet. That was enough room for two folding jump seats, allowing the cab to accommodate six passengers comfortably—three on the bench seat, two on the jump seats, and one in the passenger seat next to the driver. The trunk was large enough to hold all of their luggage. When the jump seats were stowed away, there was enough room to roll a baby stroller right in, and the ceiling was high enough for passengers to ride without having to remove their hats. Checker’s sales peaked at 8,100 cars in 1962. (Cost of a Marathon that year: $2,542. Power steering, power brakes, and air-conditioning were extra.) The following year, more than 35,000 of all taxis operating in the United States were Checkers. The company sold a number of specialty vehicles based on its famous cabs as well, including ambulances, hearses, limousines, and 12-passenger “Aerobuses” that shuttled people around airports and vacation resorts. More than 22 feet long, the eight-door Aerobus still holds the record for the longest mass-production passenger car. 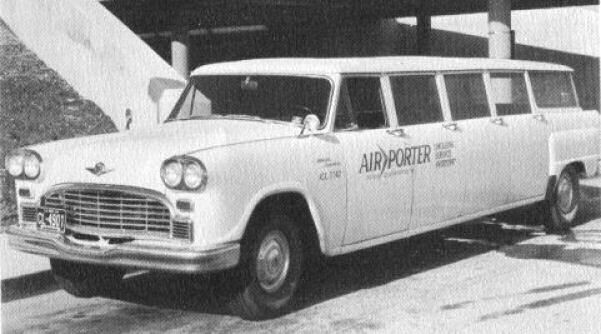 Checker also sold thousands of its taxis for use as personal vehicles, though these never proved as popular as the company hoped. One drawback of owning one was that when you stopped at a light there was a good chance that a stranger, thinking you were a taxi, would pull open the door and climb in the back. Checker’s reluctance to change anything about the car was one of its selling points; Morris Markin promised that as long as there was demand for the cars, he would continue making them the same way. About the only changes he made were when parts supplied by other companies became unavailable, or when government regulations required the changes. Marathons made after 1964, for example, have lap seat belts in the front seat (they weren’t required in the back); cabs made after 1969 have headrests on the front seats; and cabs made after 1978 have no jump seats—they failed crash tests and were ordered removed. In the 1950s, it was difficult to tell a Checker from the Fords, Chryslers, and GM cars of the day. Checkers look quite a bit like ’57 Chevy Bel Airs, for example. 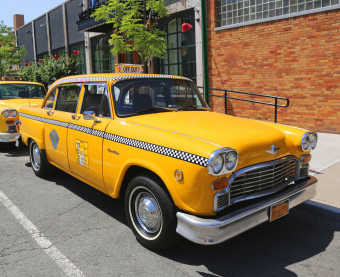 But as those cars evolved over the years and the Checker Cab did not, it gradually became one of the most recognizable vehicles in the world and a rolling, anachronistic icon of New York City. That gave the car much of its charm, but it also left it vulnerable when the soaring gasoline prices of the 1970s sent shock waves through the auto industry. As long as gasoline was cheap, Checker Cabs were inexpensive to operate. When the price soared from 36¢ a gallon to $1.27 a gallon (about $5.27 today when adjusted for inflation) in less than a decade, they weren’t anymore. As the Big Three automakers began to downsize their cars, Checker was hurt in a number of ways. For one thing, the company got most of its mechanical components (engines, transmissions, brakes, etc.) from the Big Three. But as these companies re-engineered their own cars to make them smaller and more fuel-efficient, there was no guarantee that parts for the Checker Cab would be available in the future. Ironically, the failure of the Big Three to shrink their vehicles faster also hurt Checker. That’s because when GM, Ford, and Chrysler lost market share to the smaller, more fuel-efficient cars manufactured by Volkswagen, Datsun, and Toyota, they tried to goose their flagging sales by offering special fleet prices to customers who bought cars in volume. Customers like taxi companies, for example. As Checker’s sales dwindled from one year to the next, there was less money available to design a car more suited for the times. By the 1970s, Morris Markin was gone; he’d died in 1970 and his son David took over the company. In 1976 David sold half of Checker to Ed Cole, the recently retired president of GM, for $6 million and Cole became Checker’s CEO. Cole had some successes at GM, but he was also closely associated with the Chevy Corvair and the Chevy Vega, two of the most problematic cars that GM ever built. His plans for Checker didn’t seem much better: He wanted to buy unfinished Volkswagen Golfs (then called Rabbits) from VW’s factory in the U.S., then raise the roofs several inches and stretch the cars until they were long enough to hold six passengers. He was also considering a similar model based on a stretched Chevy Citation. Both of these plans came to naught when he died in a plane crash in May 1977. Checker struggled on for a few more years, but falling sales and soaring interest rates in the late 1970s made it impossible for the company to finance any further attempts at redesigning the Checker Cab. In 1981 sales hit a new low of 500 cars, and the company declared its first loss in nearly 50 years. A few months later Checker Motors announced it was ending production of its cars. The last Marathon rolled off the assembly line in July 1982. Checker Motors continued on for nearly 30 more years as a manufacturer of parts for GM and other companies. But when rising gas prices and an economic recession made GM’s sales tank in 2008, Checker’s fortunes soured with it. David Markin’s ability to keep the company afloat using his own funds had already been damaged when he divorced his wife in 2005 and she was awarded half of his $106 million fortune. Then, when Markin lost much of the rest of his fortune by investing it with Bernie Madoff, Checker’s hopes for survival vanished entirely. Just one month after Madoff was arrested in December 2008 and charged with running the largest Ponzi scheme in history, Checker Motors filed for bankruptcy and went out of business. Today all that’s left of the company are the remaining Checker Marathons themselves…and surprisingly few of them are still around. Of the tens of thousands produced over the years, only about 700 survive. Why so few? They were taxis: most were driven into the ground and then towed to the wrecking yard and scrapped. The older Checkers are rarest of all; only about 15 made before 1960 are known to exist. Another thing that’s hard to find nowadays is a cabbie who has ever driven a Checker. That’s not just because of the passage of time, but also because there’s nothing quite like driving a Checker. When the cabs became scarce in the late 1980s and could no longer be had, either new or used, many Checker cabbies got out of the business rather than drive any cab that wasn’t a Checker. When I was in college, my roommate (a 6-5 giant of a man) owned a Checker, as did his equally huge father. Riding in it was like riding around in your living room! 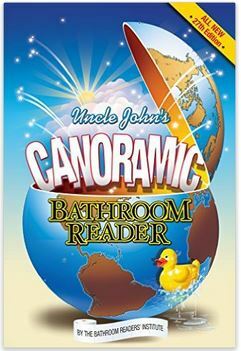 My uncle owned one, as well. Coolest car ever. He’d painted it grey but it was Checker all the way. I wonder, in the movies when they show a Checker, are they real or mock-ups? For a more accurate account, check out our Checker Cab Club website and archive. Nice article but filled with inaccurate information and glaring generalizations. FYI Checker consistently made about 5000 units a years survivor rates are also estimated to be greated at about 3000 units. Jump seats were available up until the end of production in 1982. The last attempt at new Checker was in 1982 with the very serious Galva II project.